A Creo-based plug-in that enables CAD users to make the jump to 3D MBD. MBD Tools for Creo is a plug-in application that gives Creo users a sophisticated set of tools for creating, validating, optimizing, and publishing 3D CAD models with high-quality semantic Model-Based Definition (MBD, i.e. PMI) annotations. While PTC continues to improve Creo’s MBD capabilities, users still face stumbling blocks: Despite there being little doubt regarding its value in enabling the reuse of CAD models in downstream product development processes, the process of adding PMI to a Creo model is tedious, error-prone, and time-consuming. In particular, for companies that still create annotated 2D drawings, it’s a partial duplication of effort. 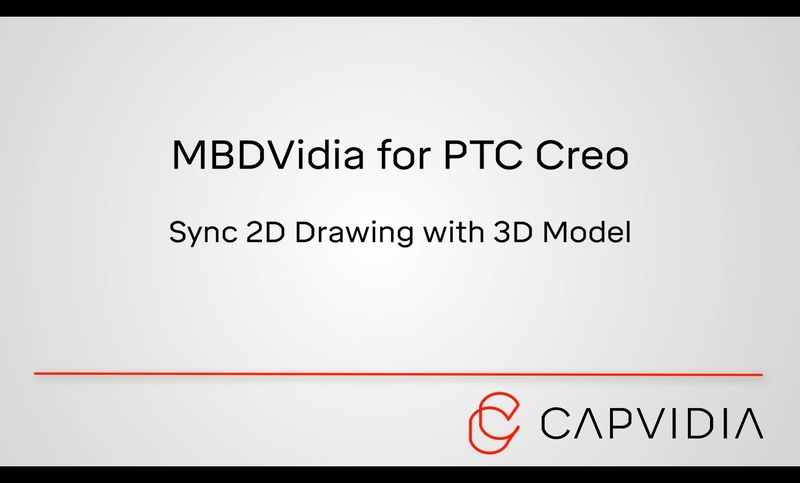 The technology in MBD Tools for PTC Creo can be used together to create inspection-ready MBD data from 2D drawings. 2D-3D Synchronization does what seems impossible: it automatically transforms 2D annotations from a Creo drawing into 3D annotations and combined states in the associated Creo model. Beyond this, it provides bi-directional synchronization with consistency checks, to ensure full associativity of annotations between the 3D model and the 2D drawing. These checks identify annotation errors and potential issues with outdated design practices commonly found in legacy 2D drawings. Assures that Creo models conform to company standards for combined states, layers, and global parameters. MBD Schema applies a template of predefined combined states, model layers, and global model parameters to any 3D annotated model. This enables companies to apply their own MBD standards to their models. “Spell Check” your 3D annotated models to ensure they are semantic and “machine-readable” by downstream applications. Export to ANSI QIF or ISO STEP AP242 transforms the model, and its annotations, into a neutral industry-standard MBD-compatible format, for use in downstream processes. Uses best in class translation technology, to create well-structured semantically correct data files.